Re-Cap: SLEEP IN 2016 Superstars Unite Worldwide! On March 11-13, people and pets around the world took to their beds for SLEEP IN 2016 (#SLEEPIN2016). Participants spent a remarkable 2,017 hours in bed collectively to make peace with sleep! Our second annual SLEEP IN brought together 92 participants from 10 countries (including Australia, Antigua and Barbuda, Canada, France, Germany, Ireland, the Philippines, South Africa and Sweden) and 31 US states. Together, our participants raised $6,110. Funds raised will provide critical support for Project Sleep’s current programming (including the Jack & Julie Narcolepsy Scholarship, Sleep Walk series, and NARCOLEPSY: NOT ALONE™ campaign) and help expand future efforts to reach people affected by sleep disorders and other barriers to sleep health. We have some highlights to share and people to thank! Friday’s InstaSleepIn kicked things off with participants sharing photos of themselves (and their pets) getting ready for bed. 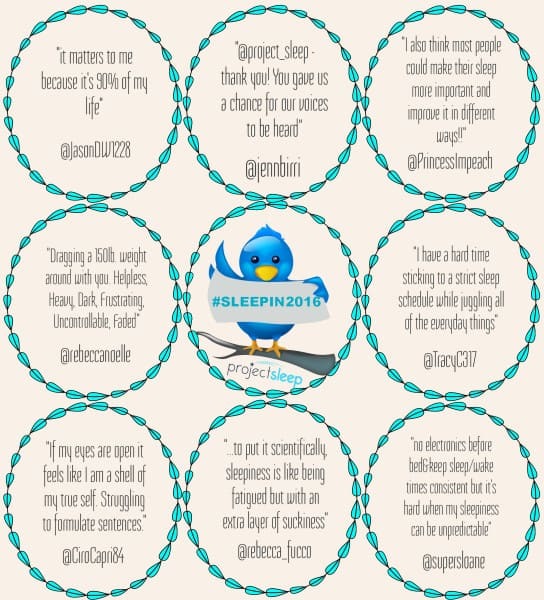 On Saturday, we hosted an official SLEEP IN Twitter Chat (#SLEEPIN2016). On Sunday, Julie Flygare and Ciro DiRuocco hosted a special live broadcast from Ireland for SLEEP IN participants via Google Hangout. 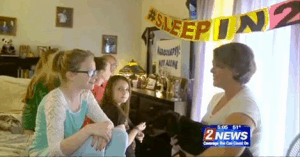 The Media Star award grand winner is Jenn Birri whose SLEEP IN was visited by her local CBS News crew! Also winners are Eleanor Wales, who wrote this essay published in Ciao magazine, and Claire Crisp, who wrote this post on her blog. The Sleep In Spirit award, for participating in our events over the weekend, grand winners are Lindy-Lou and Clayton. Also winners are Rebecca Colgate, Ashlee Wilson, and Sloane Becker. The Top Fundraiser award grand winner is Nicole Marinos. Also winners are Julie Steiner and Charli Kennedy. Project Sleep would like to thank all our participants and volunteers, especially Ciro DiRuocco, Tracy Christensen and Rebecca Fuoco for helping to make this year’s sleep in such a huge success!